Registration costs for Surf City were in keeping with most races (I paid around $90 for the half), signing up just a few months ago. And after shelling out $195 this past week for the Disneyland Half Marathon, that seems like a steal. Packet pick-up for the race was at the seaside Expo held on Friday and Saturday in the parking lot near the start line. Parking for the expo was $15 at the beach lots, but if you’re comfortable with a little walking you should be able to find a meter (bring change) within a mile or so (I used the money I saved with the meter to buy a Surf City pint glass… so someone still got my money). The expo itself is a nice time, complete with a decent amount of vendors present. There are also a few photo opportunities (I like the “pose on a surfboard” one myself). And an added bonus is that when you walk out of the expo you’re right on the beach, so hang out for bit (like I said, bring a lot of change for the meter) and enjoy the view. As I said earlier, approximately 18,000 runners swarm the beach side community of Huntington Beach for the race. And while there is parking at and along the beach, things can get a bit sticky. 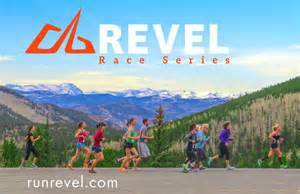 The race organizers “highly recommend” carpooling (4 to a car) and people who arrive on race morning should expect traffic delays and finding a spot might be a bit of a challenge. There are shuttle options, which I recommend, and I myself solved the problem by just getting a hotel nearby the night before and letting them drive us to and from the race. 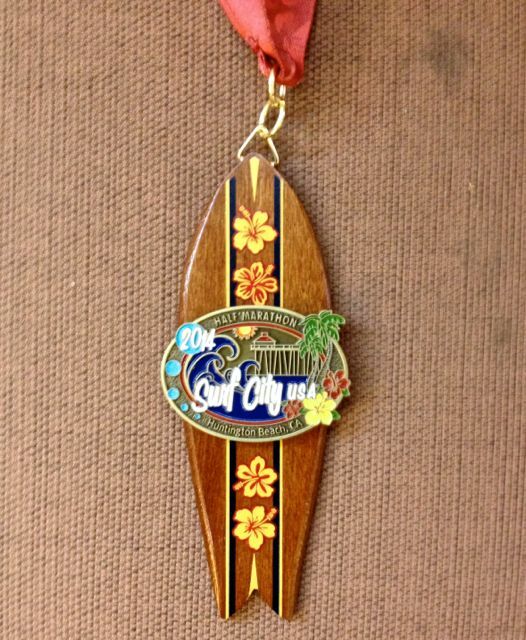 Surf City does have a great piece of swag with their finisher’s medal. Continuing their “surfboard” trend that they started in ’08, the race features a “wooden” medal supporting the race’s logo. This year’s model, nicknamed “Maverick” featured a shortboard with a floral pattern and was quite cool. The differences between the half and full medal were minimal, the biggest difference being the color of the neckband. 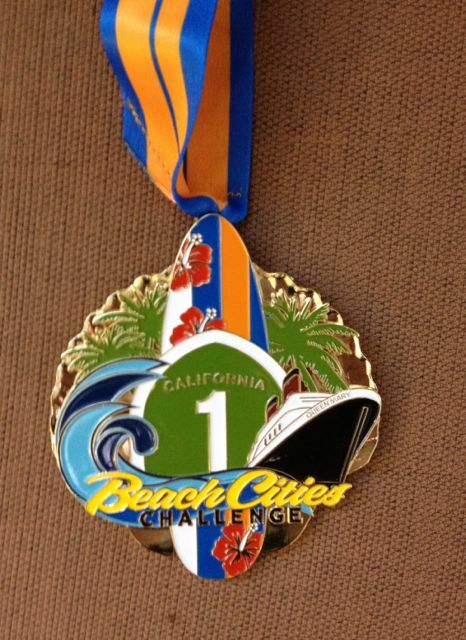 And an extra bonus for you runners who complete the “Beach Cities Challenge” is the 2014 edition of the challenge medal (I got mine yesterday). By running three consecutive races (Surf City, OC Marathon and Long Beach) you earn this gigantic medal (it’s a heavy sucker) featuring the challenge’s logo atop a golden seashell… some serious bling. And Surf City also did a good job this year with their shirts as they offered pink long sleeve shirts for the ladies and yellow ones for the men. Sure, they’re a bit loud in the color department, but they’re a good fit and mimic a bright “wetsuit” look that you might see on a surfer cutting through the waves. For all its popularity and other positive attributes, the one thing about Surf City that’s very pedestrian is the course itself. Now I’ll preface this by saying you are running along PCH near the water, which is really sweet and a great view (and smell the salty air… or maybe that’s just the sweat from the other runners). But that’s pretty much all you run. The course is basically an “out and back,” running along PCH, with one short add on. Around mile 3 you hang a right and spend the next 2-3 miles scampering around a residential neighborhood before returning to PCH a little before mile 6. From there on, it’s nothing but PCH until around mile 8 where you hang a U-turn and head back to the start (you don’t hit the residential section on the way back). For the full marathon runners it’s even more of the same as you do the same stretch out and back yet again, only closer to the beach. One great thing about Surf City though is it’s a speedy and straight course. With just a few hills in the residential section and another hill and slight upgrade a little after mile 10, this course should allow you to push yourself and shoot for a PR. And since it’s a straight course, for the most part, you don’t have to worry about adding distance to the run (I ended up only adding .06 miles over the entire race). Since it’s near the ocean you can get some winds and a slight headwind yesterday from mile 9 on did slow runners down a tad near the end. “I can add a few details about the marathon. I agree with your assessment of the course in that once you get used to the “hey, I’m running along the Pacific!” excitement, it’s fairly bland for long stretches. However, miles 3-10 of the full marathon go up to Huntington Beach Central Park and is pretty nice. The drawback in the park is that the running “trail” (paved) is very narrow and bordered by trees on one side and an incline on the other so there’s no room to pass, leaving you at the mercy of the slowest common denominator (see what I did there?). Surf City does a pretty solid job with their course support, offering plenty of water stops manned by eager volunteers. The “official” drink was Vitalyte, and Cliff shots were offered at more than one stop. I noticed several medical tents set up along the course along with numerous bike volunteers carrying supply packs like beachside St. Bernards. There were also a few bands scattered along the course belting out tunes (thanks for coming out) and I turned down my headphones whenever I ran by them. Surf City has a decent post race party, complete with a beer tent offering runners 2 free beers (a nice kind of post-race rehydration) and the opportunity to re-visit the expo to grab up a few more souvenirs (note, they’re 2-for-1). A lot of runners, myself included, did cut the post race celebration short in order to get home in time for the Super Bowl. I have to admit a little personal bias toward Surf City, as it was the site of my first ever half marathon (you never forget your first). But this is just a solid race presented on an enjoyable (if unremarkable) course and offering a slew of runners a chance to run along the beach before heading off to watch the big game. I look forward to running Surf City again in 2015 and plan to now make it one of my “annual” races. Posted on February 3, 2014, in General, Race Review and tagged Beach Cities Challenge, Huntington Beach, Surf City Marathon. Bookmark the permalink. 3 Comments. Great review, if you don’t mind, I can add a few details about the marathon. I agree with your assessment of the course in that once you get used to the “hey, I’m running along the Pacific!” excitement, it’s fairly bland for long stretches. However, miles 3-10 of the full marathon go up to Huntington Beach Central Park and is pretty nice. The drawback in the park is that the running “trail” (paved) is very narrow and bordered by trees on one side and an incline on the other so there’s no room to pass, leaving you at the mercy of the slowest common denominator (see what I did there?). All in all, I really enjoyed this race, though it is the least inspiring of the three Beach Cities races. It does, as you said, have the coolest medal however. Cool… I’ll add your comments to the review later today.